The beet is the murderer returned to the scene of the crime…the dark green sails of the grounded moon-boat stitched with veins of primordial plasma; the kite string that once connected the moon to the Earth now a muddy whisker drilling desperately for rubies. If you’ve not read any of Tom Robbins’ novels, I highly recommend that you do. I loved Fierce Invalids Home From Hot Climates (the title alone is fantastic), but Jitterbug Perfume is definitely my favourite. An epic novel, it travels from modern-day America across Europe and India in the search for immortality, and a secret perfume ingredient. It is written with Robbins’ wry sense of humour and the absurd. 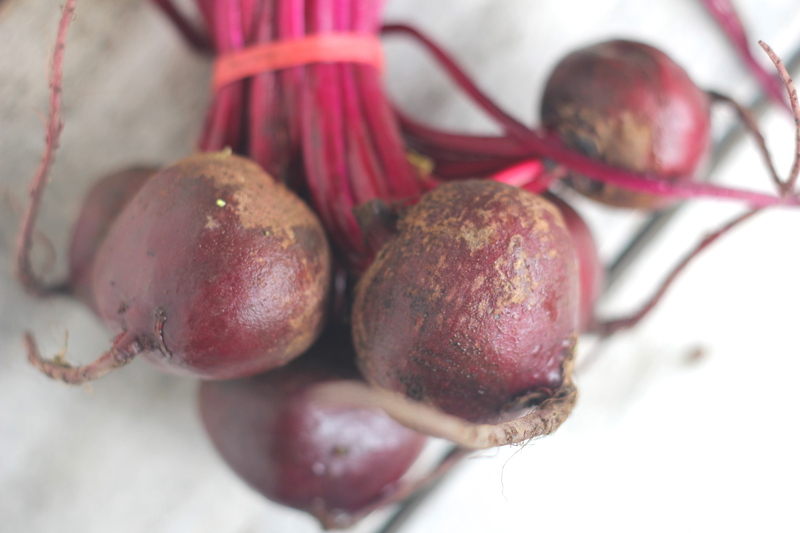 Among other things, the humble beetroot plays a major role in the story. The beetroot is hands down one of my favourite veges. It is the perfect mixture of earthy and sweet – crunchy with the taste of winter rains when raw, and deliciously decadent when roasted. Not to mention the colour – how can you not love so vibrant a vegetable. 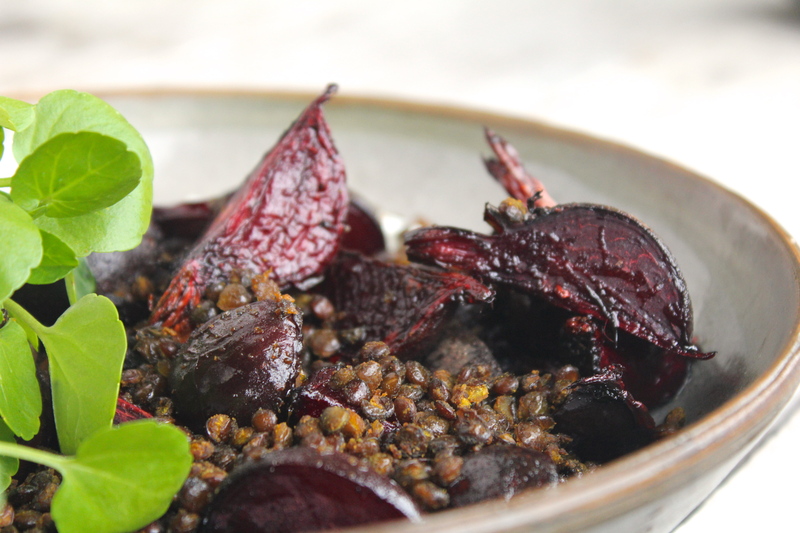 When it comes to choosing, I prefer the small deep red beetroots with the leaves still attached. I find the taste of the smaller ones slightly sweeter than the big ones, and the beetroot leaves are wonderful in salads or stirfrys, or any place really where you would habitually use greens like kale. 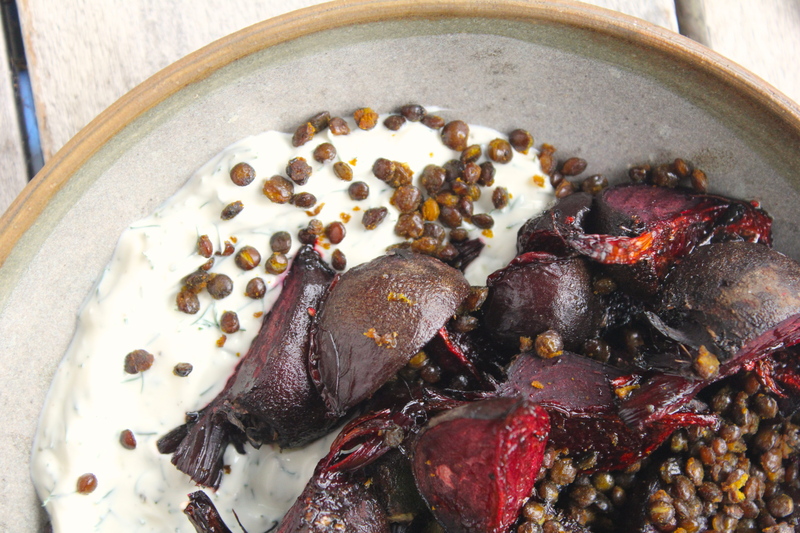 This Roasted Beetroot with Crispy Lentils & Dill Yoghurt is a perfect way to showcase the beet front and centre. Beetroot and dill are a classic combination (think: a big bowl of borscht) and roasting beets to the point of caramelisation is one of life’s simpler and greater foodie pleasures. And let’s talk about these lentils. Truth be told although I do enjoy eating lentils I often find them to be a bit blergh. You know what I mean – kinda mushy, kinda bland. Spiced up and then crisped up in the oven though is pretty much revolutionising my lentil intake. And combined with roasted beetroots and creamy yoghurt? Need I say more?! Put the lentils along with one and a half cups of cold water into a pot, cover, and bring to the boil. 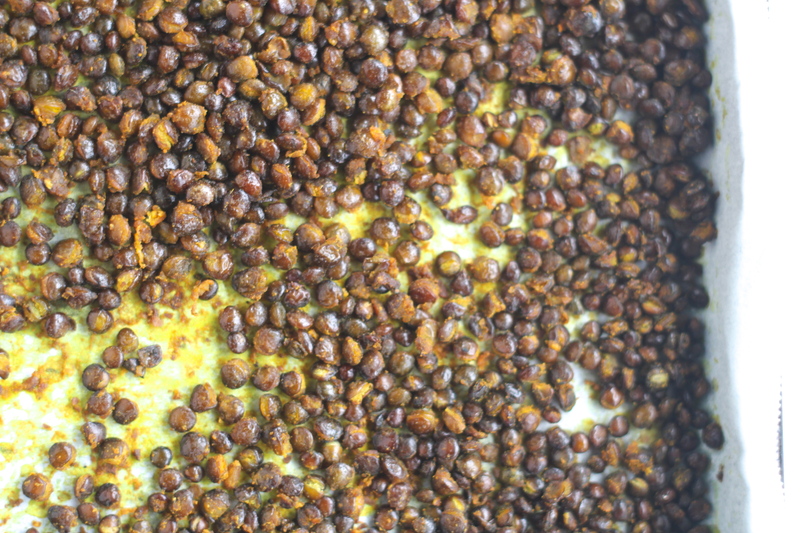 Turn down to a simmer and cook for 20 – 25 minutes, until the lentils are tender but not mushy. Leave to drain. Heat oven to 200° celsius/400° fahrenheit. 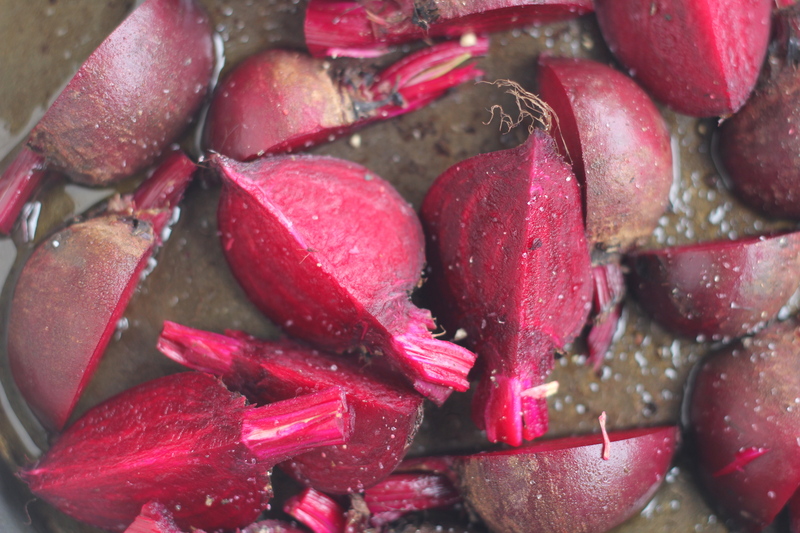 Remove the green tops from the beetroot and cut into quarters (or halves, if your beetroot are especially small). 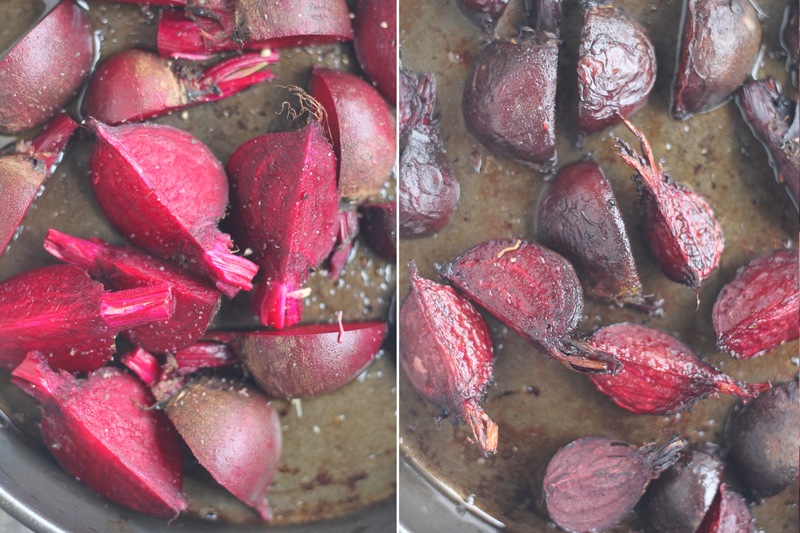 Toss the beets with a glug of olive oil, a sprinkle of salt & pepper, lay in a single layer on a baking tray and roast for 30 – 40 minutes, until tender and beginning to crisp. In a bowl combine the cooked lentils with the tablespoon of olive oil, cayenne pepper, turmeric, lemon rind, and a pinch of salt. Spread in a single layer onto a tray lined with baking paper and bake for 30 minutes (tossing halfway through), until the lentils are crispy. Set aside. Finely chop the dill and combine in a small bowl with the yoghurt and some salt & pepper. 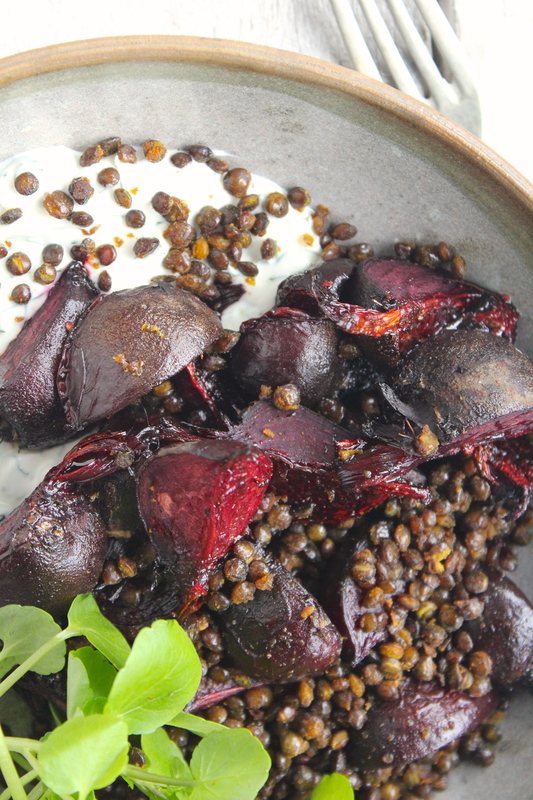 You can serve the dish in two ways: mix the beets, lentils, and yoghurt together in a large bowl and serve as a salad OR add a dollop of the yoghurt to two plates, top with the beets and finish by sprinkling the lentils over the top (as I’ve done in the pictures above). If you’re using the watercress, add a handful to each plate before eating. I like the sound of the crispy lentils. This isn’t a method I have seen before so I am keen to try it. Thanks for the idea! Definitely give it a go, and let me know how you like it. Hi Sarah, I tried it tonight and loved it. I had to change a few of the ingredients to fit what I had (e.g. carrots instead of beetroot, mint instead of dill) but the overall result was still great. 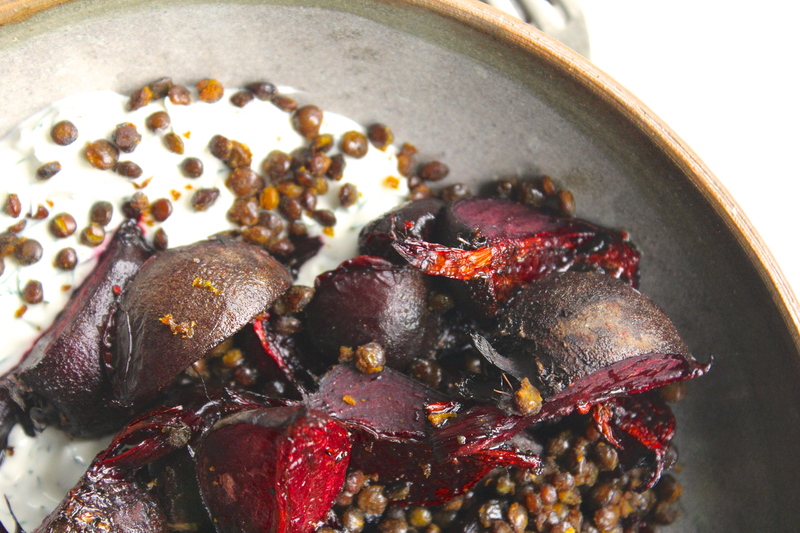 Those crispy lentils are a revelation! 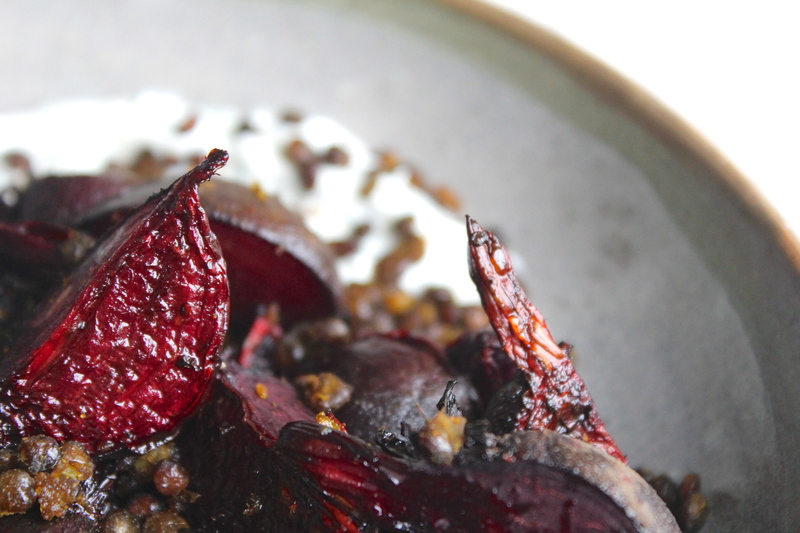 I share your love for beetroots as well as the beetroot dill combination too. I’ve been eyeing several crispy lentil recipes and I love the textural contrast you’re playing with here. Delicious looking salad! Thanks Katie! I love playing around with salads to get a good combo of taste, texture, and colour. This one definitely hits all three.